Returning to Sacred World is an unusually articulate integration of ancient mystical wisdom and contemporary personal insights about how consciousness is shifting and transforming during these evolutionarily-crucial times. Stephen Gray has a strong, clear voice, and a wide-ranging, shamanically-knowledgable perspective. Hopeful, inspiring, and thoughtfully-written, the distilled wisdom that Gray presents in this precious volume is just what our wayward species needs–to help us awaken our higher selves from their spiritual slumber, and guide us through the impending global crisis toward a promising new horizon. David Jay Brown, coauthor of Conversations on the Edge of the Apocalypse and Mavericks of the Mind, periodic guest editor for MAPS. Stephen Gray offers his readers a rare and unique gift with this wonderful book, bridging the divide between Buddhist teachings, Indigenous traditions, and the wisdom of the world of visionary plants and traditional medicines. Gray presents an in-depth look at the current spiritual, personal, and planetary crisis facing contemporary society, examining both the roots of our problems as well as sources of inspiration and teaching to help heal us of our self-imposed wounds and illusions. Filled with personal stories, inspiring quotes, and deep wisdom, all presented from the perspective of a humble spiritual seeker, this book is sure to provide answers for many who find themselves on the spiritual path and who seek their own healing, as well as the healing of our world. Martin W. Ball, Ph.D., author of several popular books on entheogens, including: Mushroom Wisdom, Sage Spirit, and The Entheogenic Evolution. Stephen is very real and a pleasure to be in conversation with. His book is excellent and a delight to read in a most refreshing way. His clear instructions will give readers the grounding, confidence, and encouragement to work with any of the medicines. Ken Littlefish (Kanucas), leading Native American Church elder and roadman of forty years experience. I have been a professional writer and editor for many years. I’ve given Stephen’s manuscript a thorough read and have no hesitation in endorsing Returning to Sacred World as a valuable contribution to its field and an important book for anyone who cares about the future of the human endeavor. To put it in no uncertain terms, these are brilliant ideas whose time has come, and not a moment too soon. Stephen is also an excellent natural writer, the organization is coherent, and the central concern—that we are in the midst of a great transformation on this planet—presents a clear and passionate call to spiritual awakening and active engagement. Dee Axelrod, former senior editor at YES magazine, journalist, novelist (forthcoming nonfiction novel Spy Moms with Guideposts), and Native American Church elder. As owner of one of North America’s leading spiritually-focused book stores for 38 years, I have also been the person responsible for choosing the books that we sell. Stephen Gray’s book brings a unique, widely-seasoned—personally fascinating!—and integrative perspective on the awakening journey in these tumultuous times. He doesn’t shy away from the hard parts, and his authenticity and humility make this important information engaging and digestible. Kolin Lymworth, owner, Banyen Books and Sound, Vancouver BC. 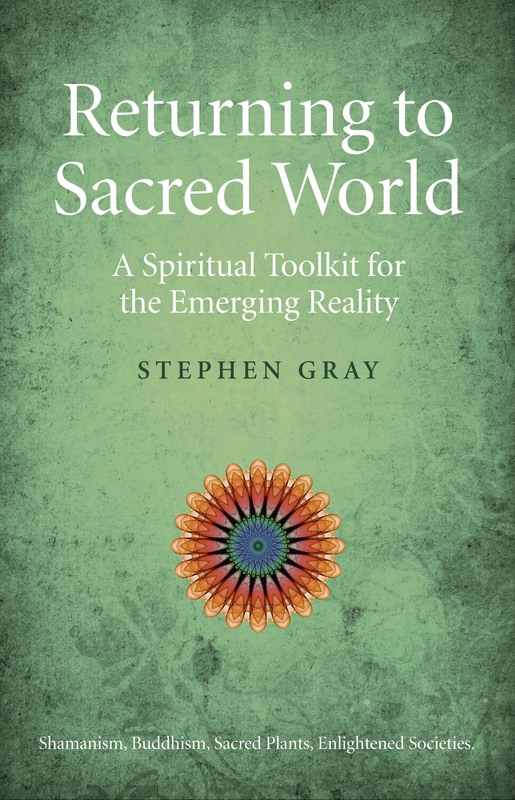 Stephen Gray presents a compelling, and at times provocative, array of insights into our world’s growing crisis of well-being and the spiritual and day-to-day means available to all of us to heal and flourish. I firmly believe this work is unique in its encompassing scope and extremely important for our times. As an editor and writer of long experience I can also say with confidence that Stephen is a natural writer, able to communicate his message with clarity and to keep his reader fully engaged from start to finish. John Wellwood, journalist and senior editor of Echo Memoirs Publishing, Vancouver BC. As Gray lays down his case for our need to recognize our spiritual disconnection, I found myself underlining more than several concepts. I was inspired to write “yes” with exclamation points in the margins at several points. I even gave one sentence a “wow”. I’m not going to tell you what that was, though. You have to readReturning to Sacred World yourself and find your own “yeses” and “wows”. By the end of Part 1, I was in agreement with Gray that now, more than ever, we need to awaken and transform. In the last section Gray provides applicable tools to further one’s practice; the spiritual journey. Gray explores the inner connections to the divine: prayer, chanting, one point and still point meditation. Gray then plunges down the rabbit-hole of using substances, entheogenic (from the Greek, that which causes to be in God) and empathogenic (causing an expansion of feelings for others), to break down the ego boundaries. He explains that plant-based medicines are ideal (as opposed to laboratory manufactured) and should be experienced in the correct setting, namely under supervision by those who have studied and know how to use these substances. Although controversial, Gray maintains that mindfully using one or more can be extremely helpful in transcending ego and furthering the awakening process. I found myself intrigued. Because of Gray’s experiences and ability to speak with an authentic voice, I would have liked to have seen him touch upon other meditative practices such as the Melchizedek method or his thoughts on doing daily affirmations as popularized by The Secret. If he explored these at all, he made no mention. That’s okay. Gray inspired me to form a personal syncretic practice as I move into my own Sacred World. And I think that was his ultimate goal. My recommendation for fellow seekers: read Returning to Sacred World, you won’t regret it for an instant. Susan Ravagni, reviewer for bookpleasures.com, a worldwide online book review site. The following is from a section in Chapter 1 of Returning to Sacred World discussing a number of very old indigenous prophecies and their relevance to our current situation. Hi Lisa. It could be some version of cosmic stumbling but not the one you’re thinking of. I’ve been to Peru a couple of times but not Pisac. While I’ve got you, I’d like to suggest you look at the website of the conference I co-organize in Vancouver, BC. It’s called the Spirit Plant Medicine Conference, now in its fifth year, http://www.spiritplantmedicine.com. Our vision is to help inform people of the wisest, most effective, and most responsible ways to engage with these sacramental medicines. Maybe you could come to Vancouver on the weekend of Oct. 24 and 25 and be part of the community that supports this vision. If not, maybe you’d be so kind as to share the information with your network. We really believe it’s essential to get this work right at this foundational stage and ‘re-birthing’ period.